It doesn’t matter if you’ve applied for one job in your life, or one hundred. The fact is the whole process can be a little worrying. That’s why we try to do things a better way. We believe to get the best out of someone you need to make them feel relaxed and as comfortable as possible. We want to see the ‘real’ you, not the ‘nervous’ you. Only then can we assess your suitability. Being at ease also allows you to really showcase what you’re capable of. And why we should pick you to join our team. There are several stages in our recruitment process. These include submitting an application and undertaking an assessment or selection process to test whether you’re the right person for the role. 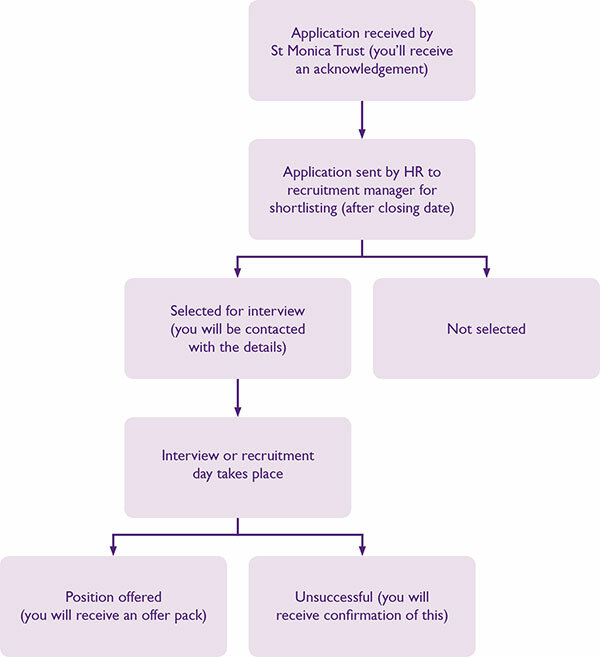 This flow chart below shows you what happens to your application form once it’s been submitted - taking you through the whole recruitment process. Your details will be processed for recruitment and selection purposes and are stored for a period of 12 months under the Data Protection Act 1998. It’s also worth pointing out that we get loads of applications. This means that , sadly, we aren’t always able to provide individual feedback to you once you have submitted your application. On the following pages you will see lots of hints, tips and guidance on completing your application. You can also find out more about what to expect and how to prepare for an interview or recruitment day. Learn more about our application process and how to maximise your chances of success. Learn more about our recruitment days and what to expect if you get an interview at St Monica Trust.